This Chicken Madeira recipe is even better than the cheesecake factory version !! 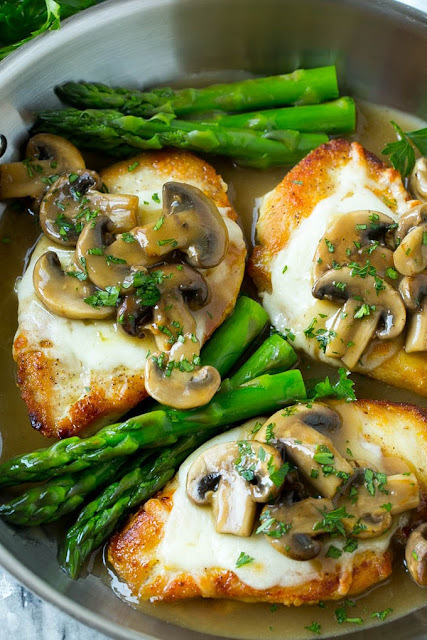 Chicken breasts are smothered in mozzarella cheese, the most delicious mushroom sauce, and served alongside asparagus. The perfect dinner for any occasion ! The chicken madeira – you just can’t go wrong with golden brown chicken, melty cheese, amazingly delicious mushroom sauce and asparagus. This chicken madeira recipe is even better than the Cheesecake Factory version! Chicken breasts are smothered in mozzarella cheese, the most delicious mushroom sauce, and served alongside asparagus. The perfect dinner for any occasion! Heat the olive oil in a large pan over medium high heat. Season the chicken breasts on both sides with salt and pepper to taste. Place the chicken in the pan and cook for 4-5 minutes on each side until golden brown and cooked through. Remove the chicken from the pan; place on a plate and cover to keep warm. Add the mushrooms to the pan and season to taste with salt and pepper. Cook until softened, 4-5 minutes. Add the wine and beef broth to the pan; simmer for 7-9 minutes or until liquid is reduced by half. Add the cornstarch and stir until smooth. Bring the mixture to a boil and cook for 1 minute or until thickened. Stir in the butter until melted and incorporated into the sauce. Preheat the broiler. Place the chicken and asparagus on a sheet pan coated in cooking spray. Season the asparagus with salt and pepper and sprinkle the cheese over the chicken. Broil for 3-4 minutes or until cheese is melted and asparagus is just tender. Remove the pan from the oven. Place a chicken breast and some asparagus onto each of 4 plates. Pour the mushroom sauce over each chicken breast and serve, topped with parsley.